Reverse Spins Editor's Note: The following is an excerpt from the introduction to The Lives of Alcyone. The book is about the past lives of J. Krishnamurti. As incredible as it may seem, Besant and Leadbeater tracked 48 of his previous lives. The interplay of karma and the interaction of personal lives is fascinating to behold as the soul known as Alcyone (Krishnamurti) is traced back through the millennia even to ages long forgotten. In order to familiarize the reader with how cosmic law works regarding reincarnation, the authors included this explanation in the introduction. They emphasize that there are souls who have ties with one another and given the right circumstances, sometimes come together for a higher purpose. Such was the case according to them when the early founders of the Theosophical Society came together and it was especially so as they penned this book with the soul they were inextricably connected toAlcyone. "In deciding the actual place of rebirth three principal factors come into play. First and greatest of all comes the influence of the Law of Evolution. The Deity wills man's advancement, and that Will exerts upon him a steady and ceaseless pressure. The action of that Law tends always to place a man in such surroundings as are best suited to develop whatever qualities are, lacking in him, entirely irrespective either of his likes and dislikes or of his deserts. The man in his short-sightedness often thinks of such action as unpleasant and even hostile to his progress; for he naturally desires surroundings which will give him the opportunity of doing what he can already do well, whereas the Law tends rather to put him where he will be compelled to learn to do those things which as yet he cannot doto develop the qualities which at present he does not possess. The second factor which comes into play in deciding where a man shall be reborn is his own karmathe result of his past actions. If uncontrolled, the Law of Evolution would give him the best possible opportunities for development; but his past lives may not have been such as to deserve those opportunities. For that reason it may not be possible to give him the most suitable place, so he has to put up with the second best. The exactitude with which any possible combination of karma expresses itself in the surroundings provided is most marvellous; it is often evident that no other place in the whole world would be so suitable as that in which the man finds himself. If one may put it so without irreverence, the location of the quite undeveloped man presents no problem to the karmic deities; if he is to be born in a savage race, it cannot matter much whether it is in Central Africa, in South America, or among the aborigines of Australia ; if he must see the light in a slum, it can scarcely be important whether it shall be Montmartre, the Bowery, or the Seven Dials. The rough impacts, which alone can make any impression upon him as yet, can be found alike in all these places. But the developed man must present much greater difficulties, for he has previously set in motion multitudes of finer forces of all sorts, and therefore an environment in which their effects can play upon him is necessary. Any one of a hundred places would probably do equally well for the young soul; he has so many lessons to learn that it does not much matter which he takes first, or where he receives his preliminary teaching. But the older soul needs special treatment, and the one niche specially provided for him is usually the only one in all the world which is really suitable for him. It is in the nature of the case that he very rarely thinks so, because not his likings but his true interests have been consulted when the arrangement was made; but the statement is nevertheless a true one. The third factor which influences the rebirth of a man is another variant of his karmathe links which he has made with other egos in previous lives. All the minor good and evil that we do goes into a general debit and credit account, and is worked off impersonally; but if we so affect the life of another as considerably to help or to hinder his evolution, we form a personal tie with him, which necessitates another meeting latersometimes many other meetings. Unselfish love is one of the strongest forces in the world, and it draws egos together again and again, thereby largely modifying for the time the action of the forces of evolution and of karma. Not that any man can ever escape the consequences of anything that he has done; the debt must inevitably be paid, but the time and the conditions are often much altered by the introduction of this wonderful power of strong affection. Many instances of this will be noticed in the lines of lives which have been published for our study. It seems evident that in the flowing of the long stream of our lives we gather together into groupsor it may be that we originally come forth in such groupsusually having as their centre some one dominant ego. In the history of the lives of Alcyone we see such a group (or perhaps traces of two groups) drawn round the mighty individualities of two Great Ones who have since attained the level of Adeptship. As we press back further and further into the mists of the remote past we find this little circle of egos ever more closed associated. That does not in the least imply that the bonds between them have been loosened of late; on the contrary they seem stronger than ever. The suggestion is rather that the members have recently been strong enough to separate for a time without losing their connectionsthat each could go wherever it was necessary in order to develop missing qualities or to learn special lessons, without any danger that in doing this he would forget his comrades, or find his love for them grown weaker. So during the last few thousand years they have met somewhat less often than of yore, while each has been learning to stand alone; but in this present incarnation the whole group has once more been drawn togethernot this time by mere family relationship, but by the far stronger tie of a common interest in a common work, following as ever the august Leaders to whom they owe everything that they have and that they arethe Masters of the Wisdom in whose hands lies the destiny of the Race that is to be. 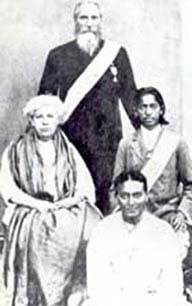 In this life they are loyal members of the Theosophical Society, and through it they are devoting to the service of humanity all the powers that they have gained through the storms and calms, the joys and sorrows of the many lives which lie behind them. For some of them at least the promise has been given that they shall part no morethat all their future shall be devoted to the work they love so well under the great Captains with whom their lives are so intimately united. To this group we have given the name of Servers, and we find that throughout their history it has been their privilege to be employed in the pioneer work connected with the beginning of new sub-races. All those whose lives have been specially investigated so far are members of this group, and we find that with them the fact of that membership has always been the most important element in determining the time and place of their rebirth. Emotional or intellectual, spiritual or material in disposition, they have had to move down the ages together, and so the result of the generation of a larger amount of spiritual force in any given life has been not (as is usual) a longer period of heaven-life, but a period of greater intensity of enjoyment. ..."
This book comes in two volumes, is expensive and hard to find. Health Research publishes the book for $49.70. They are photocopies and spiral bound. My copy is a little difficult to read. They photocopied a book that somebody had underlined. Go figure. Sometimes you can find a deal at ABE. I just did a search. 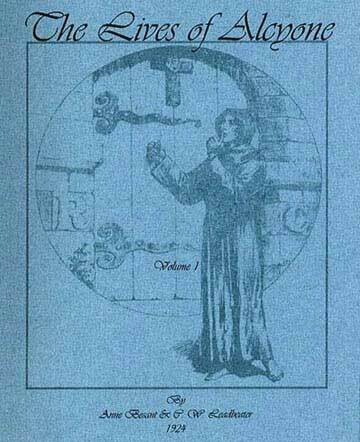 Volume I was available for $18.95. The rest were expensive. Half.com currently has Vols. I & 2 for $35.95.